Log in to the Azure Portal and navigate to Azure Active Directory. The Overview window is displayed. Click Enterprise applications. The Enterprise applications window is displayed. Click New application. The Add your own application window is displayed. In the Name field, enter a name, and click Add. The quick start window is displayed. Click on Configure single sign-on (required). The Single Sign-on window is displayed. 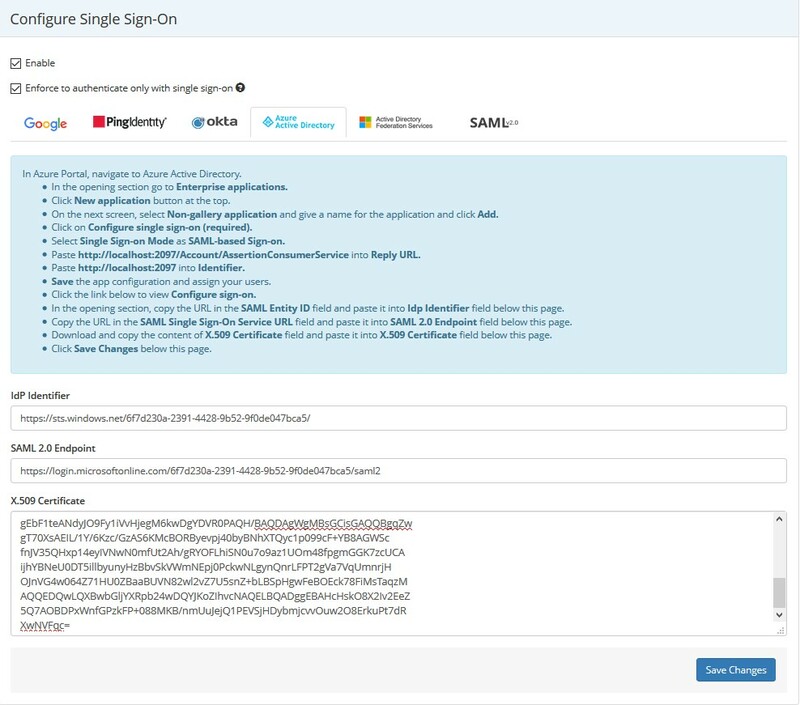 From the Single Sign-on Mode dropdown, select SAML-based Sign-On. Log in to Netsparker Enterprise, and from the main menu, click Settings, then Single Sign-On. The Single Sign-On window is displayed. Select the Azure Active Directory tab. Copy the URL from the SAML 2.0 Service URL field. In Azure Active Directory, paste the URL into the Reply URL field. In Azure Active Directory, paste the URL into the Identifier field. Click Configure Netsparker Enterprise (the name you entered in the Name field in Step 5). The ConfigureSign-On window is displayed. In the window that is displayed, copy the URL from the the SAML Entity ID field. Log in to Netsparker Enterprise, and from the main menu, click Settings, then Single Sign-On. The Single Sign-On window is displayed. Select the Azure Active Directory tab. Paste the URL into the IdP Identifier field. In Azure Active Directory, copy the URL from the SAML Single Sign-On Service URL field. In Netsparker Enterprise's Single Sign-On window, paste the URL into the SAML 2.0 Endpoint field. In Azure Active Directory, download and copy the content of the X.509 Certificate field. In Netsparker Enterprise's Single Sign-On window, paste the URL into the X.509 Certificate field.